Haruhi wants you!! 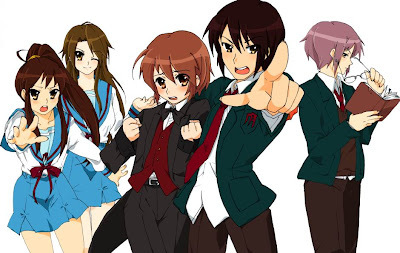 The Haruhi Gender Bender Project | FULL MOE PANIC!!! ← My fan art: Trying to create but ended up copying. We want you!! For the Glory of Haruhi!!! As most of you folks out there would have known by now, there is a massive undertaking at animesuki forums to rewrite Suzumiya Haruhi no Yuutsu where all the characters will be gender swapped. I have personally joined my comrades in the forum to contribute to this project which i view as a most holy undertaking by fans who love the series. So, I hereby appeal to all of Haruhi’s followers and minions to join in the Great Crusade to make history in the name of The God- Empress and the Holy St. Nagato. Join the Her Holy Crusade here. That is all. Setsuna out. This entry was posted in Fan Project, Otaku, Suzumiya Haruhi. Bookmark the permalink. Lol, I’m so behind times that I’ve actually found out about this gender bender project today XD. @choo: I still wonder why they did replace Van der Sar in the first place. No one replaces a goalie unless he is severely wounded! Ferguson no Baka! I’ll stick to being a spectator and see how this would turn out in the future. @d_blade: lol dont worry, this blog is full of randomness as it is. @choo: join!! Haruhi compels you to do so!! or will it be Haruki now?